The hansoms, after passing through this impressive portal of the station, bowl smoothly across a courtyard which is in the center of the terminal hotel, an institution dear to most railways in Europe. The trav­eler lands amid a swarm of porters, and then proceeds cheerfully to take the customary trouble for his luggage. America provides a contrivance in a thousand situations where Europe provides a man or perhaps a number of men and the work of our brass check is here done by porters, directed by the trav­eler himself. The men lack the memory of the check; the check never forgets its iden­tity. Moreover, the European railways gen­erously furnish the porters at the expense of the traveler. Nevertheless, if these men have not the invincible business precision of the check, and if they have to be tipped, it can be asserted for those who care that in Europe one-half of the populace waits on the other half most diligently and well. 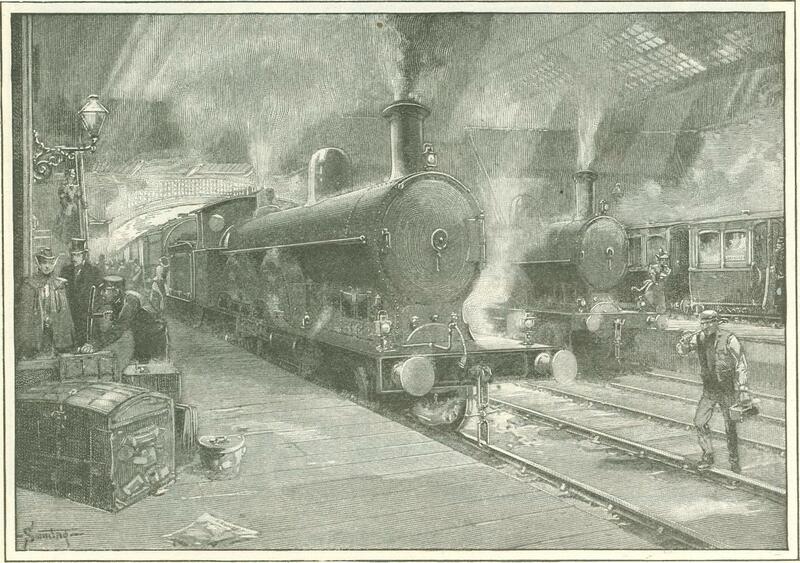 Against the masonry of a platform, under the vaulted arch of the train-house, lay a long string of coaches. They were painted white on the bulging part, which led half­way down from the top, and the bodies were a deep bottle-green. There was a group of porters placing luggage in the van, and a great many others were busy with the affairs of passengers, tossing smaller bits of luggage into the racks over the seats, and bustling here and there on short quests. The guard of the train, a tall man who resembled one of the first Napoleon's veterans, was caring for the distribution of passengers into the vari­ous bins. There were no second-class com­partments; they were all third and first-class. The train was at this time engineless, but presently a railway "flier," painted a glow­ing vermilion, slid modestly down and took its place at the head. The guard walked along the plat­form, and de­cisively closed each door. He wore a dark blue uniform thoroughly decorated with silver braid in the guise of leaves. The way of him gave to this business the importance of a ceremony. Meanwhile the fireman had climbed down from the cab and raised his hand, ready to transfer a sig­nal to the driver, who stood looking at his watch. In the interval there had something pro­gressed in the large signal-box that stands guard at Euston. This high house contains many levers, standing in thick, shining ranks. It perfectly resembles an organ in some great church, if it were not that these rows of numbered and indexed handles typify some­thing more acutely human than does a keyboard. It requires four men to play this organ-like thing, and the strains never cease. Night and day, day and night, these four men are walking to and fro, from this lever to that lever, and under their hands the great machine raises its endless hymn of a world at work, the fall and rise of signals and the clicking swing of switches. And so as the vermilion engine stood wait­ing and looking from the shadow of the curve-roofed station, a man in the signal-house had played the notes which informed the engine of its freedom. The driver saw the fall of those proper semaphores which gave him liberty to speak to his steel friend. A certain combination in the economy of the London and Northwestern Railway, a com­bination which had spread from the men who sweep out the carriages through in­numerable minds to the general man­ager himself, had resulted in the law that the vermilion engine, with its long string of white and bottle-green coaches, was to start forth­with toward Scotland. Presently the fireman, standing with his face to­ward the rear, let fall his hand. "All right," he said. The driver turned a wheel, and as the fireman slipped back, the train moved along the platform at the pace of a mouse. To those in the tranquil carriages this starting was probably as easy as the sliding of one's hand over a greased surface, but in the en­gine there was more to it. The monster roared suddenly and loudly, and sprang for­ward impetuously. A wrong-headed or mad­dened draft-horse will plunge in its collar sometimes when going up a hill. But this load of burdened carriages followed imper­turbably at the gait of turtles. They were not to be stirred from their way of dignified exit by the impatient engine. The crowd of porters and transient people stood respectful. They looked with the indefinite wonder of the railway-station sight-seer upon the faces at the windows of the passing coaches. This train was off for Scotland. It had started from the home of one accent to the home of another accent. It was going from manner to manner, from habit to habit, and in the minds of these London spectators there surely floated dim images of the traditional kilts, the burring speech, the grouse, the canniness, the oat-meal, all the elements of a ro­mantic Scotland. The train swung impres­sively around the signal-house, and headed up a brick-walled cut. In start­ing this heavy string of coaches, the engine breathed explosively. It gasped, and heaved, and bellowed; once, for a moment, the wheels spun on the rails, and a con­vulsive tremor shook the great steel frame. The train itself, however, moved through this deep cut in the body of London with coolness and precision, and the employees of the railway, knowing the train's mission, tacitly presented arms at its passing. To the travelers in the carriages, the suburbs of London must have been one long monotony of carefully made walls of stone or brick. But after the hill was climbed, the train fled through pictures of red hab­itations of men on a green earth. But the noise in the cab did not greatly change its measure. 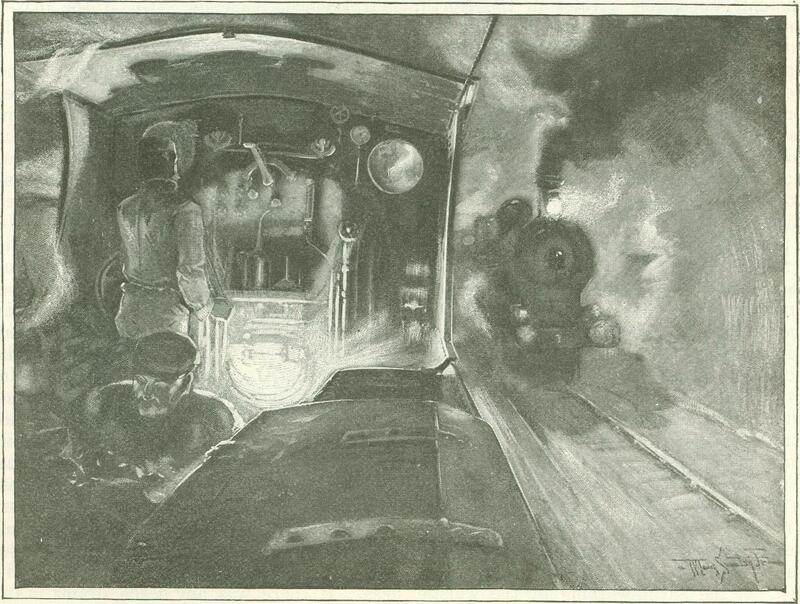 Even though the speed was now high, the tremendous thumping to be heard in the cab was as alive with strained effort and as slow in beat as the breathing of a half-drowned man. At the side of the track, for instance, the sound doubtless would strike the ear in the famil­iar succession of incredibly rapid puffs; but in the cab itself, this land-racer breathes very like its friend, the marine engine. Everybody who has spent time on shipboard has forever in his, head a reminiscence of the steady and methodical pounding of the engines, and perhaps it is curious that this relative, which can whirl over the land at such a pace, breathes in the leisurely tones that a man heeds when he lies awake at night in his berth. 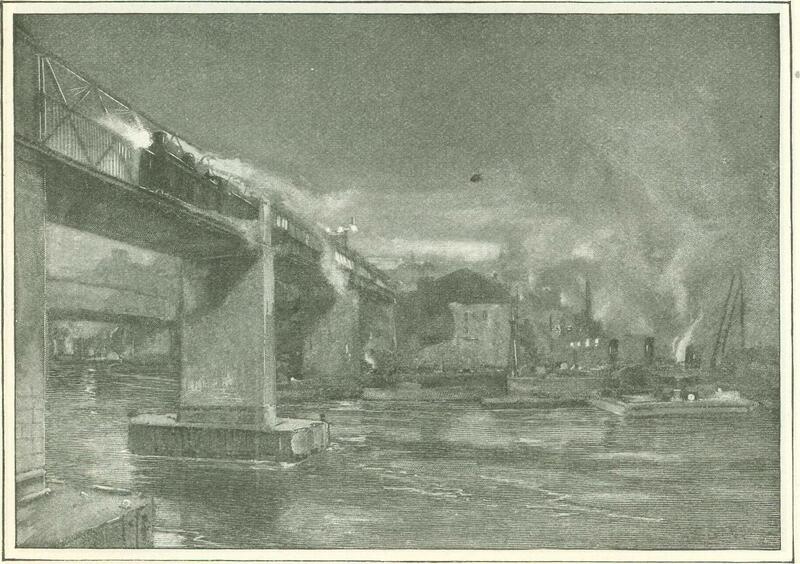 There had been no fog in London, but here on the edge of the city a heavy wind was blowing, and the driver leaned aside and yelled that it was a very bad day for traveling on an engine. The engine-cabs of England, as of all Europe, are seldom made for the comfort of the men. One finds very often this apparent disregard for the man who does the work - this indifference to the man who occupies a position which for the exercise of temperance, of courage, of honesty, has no equal at the altitude of prime ministers. The American engineer is the gilded occupant of a salon in comparison with his brother in Europe. 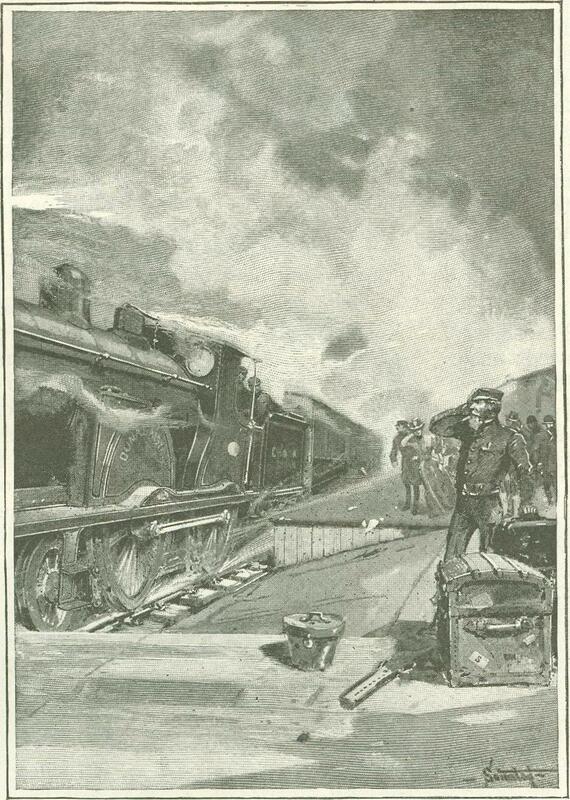 The man who was guiding this five-hundred-ton bolt, aimed by the officials of the rail­way at Scotland, could not have been as comfortable as a shrill gibbering boatman of the Orient. The narrow and bare bench at his side of the cab was not directly intended for his use, because it was so low that he would be prevented by it from looking out of the ship's port-hole which served him as a window. The fireman, on his side, had other diffi­culties. His legs would have had to straggle over some pipes at the only spot where there was a prospect, and the builders had also strategically placed a large steel bolt. Of course it is plain that the com­panies consistently believe that the men will do their work better if they are kept stand­ing. The roof of the cab was not altogether a roof: It was merely a projection of two feet of metal from the bulkhead which formed the front of the cab. There were practically no sides to it, and the large cinders from the soft coal whirled around in sheets. From time to time the driver took a handkerchief from his pocket and wiped his blinking eyes. London was now well to the rear. The ver­milion engine had been for some time flying like the wind. This train averages, between London and Carlisle, forty-nine and nine-tenth miles an hour. It is a distance of 299 miles. There is one stop. It occurs at Crewe, and endures five minutes. In consequence, the block-signals flashed by seemingly at the end of the moment in which they were sighted. There can be no question of the statement that the road-beds of English railways are at present immeasurably superior to the Ameri­can road-beds. Of course there is a clear reason. It is known to every traveler that peoples of the Continent of Europe have no right at all to own railways. Those lines of travel are too childish and trivial for expres­sion. A correct fate would deprive the Con­tinent of its railways, and give them to some­body who knew about them. The continental idea of a railway is to surround a mass of machinery with forty rings of ultra-military law, and then they believe they have one complete. The Americans and the English are the railway peoples. That our road-beds are poorer than the English road-beds is be­cause of the fact that we were suddenly obliged to build thousands upon thousands of miles of railway, and the English were obliged to slowly build tens upon tens of miles. A road-bed from New York to San Francisco, with stations, bridges, and cross­ings of the kind that the London and North­western owns from London to Glasgow, would cost a sum large enough to support the German army for a term of years. The whole way is constructed with the care that inspired the creators of some of our now ob­solete forts along the Atlantic coast. An American engineer, with his knowledge of the difficulties he had to encounter - the wide rivers with variable banks, the moun­tain chains, perhaps the long spaces of abso­lute desert; in fact, all the perplexities of a vast and somewhat new country - would not dare spend a respectable portion of his al­lowance on seventy feet of granite wall over a gully, when he knew he could make an em­bankment with little cost by heaving up the dirt and stones from here and there. But the English road is all made in the pattern by which the Romans built their highways. After England is dead, savants will find narrow streaks of ma­sonry leading from ruin to ruin. Of course this does not always seem convincingly admirable. It sometimes re­sembles energy poured into a rat-hole. There is a vale be­tween expediency and the convenience of posterity, a mid-ground which enables men to surely benefit the hereafter people by valiantly advancing the present; and the point is that, if some laborers live in un­healthy tenements in Cornwall, one is likely to view with incomplete satisfaction the re­cord of long and patient labor and thought displayed by an eight-foot drain for a non­existent, impossible rivulet in the North. 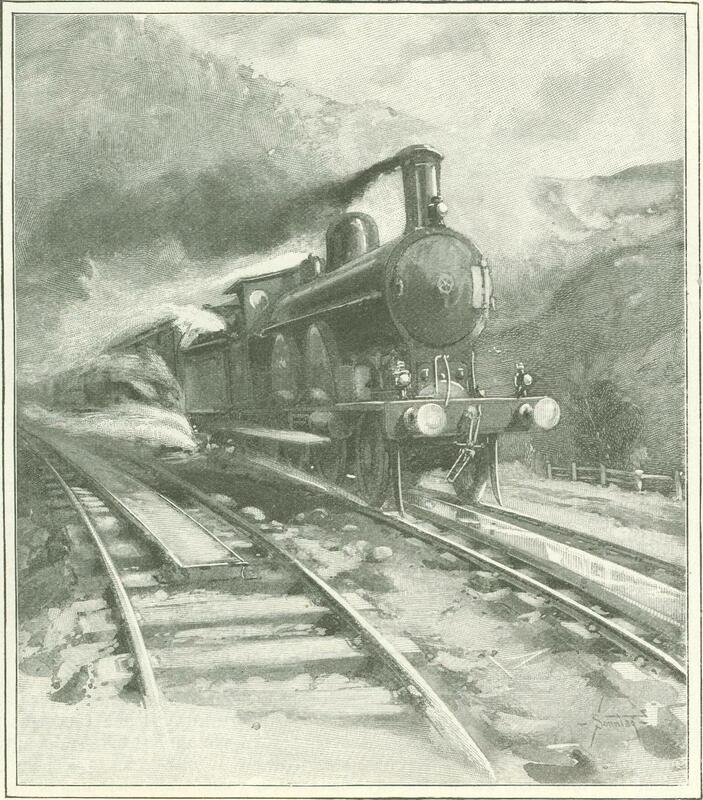 This sentence does not sound strictly fair, but the meaning one wishes to convey is that, if an English company spies in its dream the ghost of an ancient valley that later be­comes a hill, it would construct for it a magnificent steel trestle, and consider that a duty had been performed in proper accord­ance with the company's conscience. 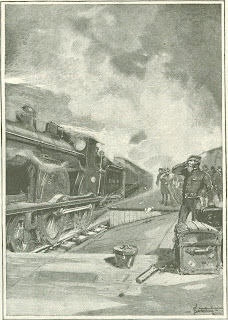 But after all is said of it, the accidents and the miles of railway operated in England is not in proportion to the accidents and the miles of railway operated in the United States. The reason can be divided into three parts - older conditions, superior caution, and road-bed. And of these, the greatest is older conditions. In this flight toward Scotland one seldom encountered a grade crossing. In nine cases out of ten there was either a bridge or a tunnel. The platforms of even the remote country stations were all of ponderous ma­sonry in contrast to our constructions of planking. There was always to be seen, as we thundered toward a station of this kind, a number of porters in uniform, who re­quested the retreat of any one who had not the wit to give us plenty of room. And then, as the shrill warning of the whistle pierced even the uproar that was about us, came the wild joy of the rush past a station. It was something in the nature of a trium­phal procession conducted at thrilling speed. Perhaps there was a curve of infinite grace, a sudden hollow explosive effect made by the passing of a signal-box that was close to the track, and then the deadly lunge to shave the edge of a long platform. There were always a number of people standing afar, with their eyes riveted upon this projectile, and to be on the engine was to feel their in­terest and admiration in the terror and gran­deur of this sweep. A boy allowed to ride with the driver of the band-wagon as a cir­cus parade winds through one of our village streets could not exceed for egotism the temper of a new man in the cab of a train like this one. This valkyric journey on the back of the vermilion engine, with the shout­ing of the wind, the deep, mighty panting of the steed, the gray blur at the track-side, the flowing quicksilver ribbon of the other rails, the sudden clash as a switch intersects, all the din and fury of this ride, was of a splendor that caused one to look abroad at the quiet, green landscape and believe that it was of a phlegm quite beyond patience. It should have been dark, rain-shot, and windy; thunder should have rolled across its sky. It seemed, somehow, that if the driver should for a moment take his hands from his engine, it might swerve from the track as a horse from the road. Once, indeed, as he stood wiping his fingers on a bit of waste, there must have been something ludicrous in the way the solitary passenger regarded him. Without those finely firm hands on the bridle, the engine might rear and bolt for the pleas­ant farms lying in the sunshine at either side. This driver was worth contemplation. He was simply a quiet, middle-aged man, beard­ed, and with the little wrinkles of habitual geniality and kindliness spreading from the eyes toward the temple, who stood at his post-always gazing out, through his round window, while, from time to time, his hands went from here to there over his levers. He seldom changed either attitude or expres­sion. There surely is no engine-driver who does not feel the beauty of the business, but the emotion lies deep, and mainly inarticu­late, as it does in the mind of a man who has experienced a good and beautiful wife for many years. This driver's face displayed nothing but the cool sanity of a man whose thought was buried intelligently in his busi­ness. If there was any fierce drama in it, there was no sign upon him. He was so lost in dreams of speed and signals and steam, that one speculated if the wonder of his tempestuous charge and its career over England touched him, this impassive rider of a fiery thing. It should be a well-known fact that, all over the world, the engine-driver is the finest type of man that is grown. He is the pick of the earth. He is altogether more worthy than the soldier, and better than the men who move on the sea in ships. He is not paid too much; nor do his glories weight his brow; but for outright performance, carried on constantly, coolly, and without elation, by a temperate, honest, clear-minded man, he is the further point. And so the lone human at his station in a cab, guarding money, lives, and the honor of the road, is a beautiful sight. The whole thing is aesthetic. The fireman presents the same charm, but in a less degree, in that he is bound to appear as an apprentice to the finished manhood of the driver. In his eyes, turned always in question and confidence toward his superior, one finds this quality; but his aspirations are so direct that one sees the same type in evo­lution. There may be a popular idea that the fire­man's principal function is to hang his head out of the cab and sight interesting objects in the landscape. As a matter of fact, he is always at work. The dragon is insatiate. The fireman is continually swinging open the furnace-door, whereat a red shine flows out upon the floor of the cab, and shoveling in immense mouthfuls of coal to a fire that is almost diabolic in its madness. The feeding, feeding, feeding goes on until it appears as if it is the muscles of the fireman's arms that are speeding the long train. An engine running over sixty-five miles an hour, with 500 tons to drag, has an appetite in propor­tion to this task. View of the clear-shining English scenery is often interrupted between London and Crewe by long and short tunnels. The first one was disconcerting. Suddenly one knew that the train was shooting toward a black mouth in the hills. It swiftly yawned wider, and then in a moment the engine dove into a place inhabited by every demon of wind and noise. The speed had not been checked, and the uproar was so great that in effect one was simply standing at the center of a vast, black-walled sphere. The tubular construc­tion which one's reason proclaimed had no meaning at all. It was a black sphere, alive with shrieks. But then on the surface of it there was to be seen a little needle-point of light, and this widened to a detail of unreal landscape. It was the world; the train was going to escape from this cauldron, this abyss of howling darkness. If a man looks through the brilliant water of a tropical pool, he can sometimes see coloring the marvels at the bottom the blue that was on the sky and the green that was on the foliage of this detail. And the picture shimmered in the heat-rays of a new and remarkable sun. It was when the train bolted out into the open air that one knew that it was his own earth. Once train met train in a tunnel. Upon the painting in the perfectly circular frame formed by the mouth there appeared a black square with sparks bursting from it. This square expanded until it hid everything, and a moment later came the crash of the pass­ing. It was enough to make a man lose his sense of balance. It was a momentary in­ferno when the fireman opened the furnace-door and was bathed in blood-red light as he fed the fires. The effect of a tunnel varied when there was a curve in it. One was merely whirling then-heels overhead, apparently, in the dark, echoing bowels of the earth. There was no needle-point of light to which one's eyes clung as to a star. From London to Crewe, the stern arm of the semaphore never made the train pause even for an instant. There was always a clear track. It was great to see, far in the distance, a goods train whooping smokily for the north of England on one of the four tracks. 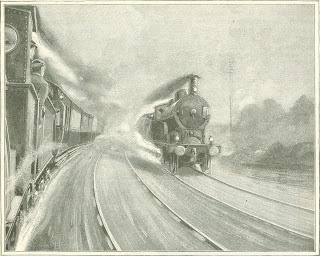 The overtaking of such a train was a thing of magnificent nothing for the long strided engine, and as the flying express passed its weaker brother, one heard one or two feeble and immature puffs from the other engine, saw the fireman wave his hand to his luckier fellow, saw a string of foolish, clank­ing flat-cars, their freights covered with tar­paulins, and then the train was lost to the rear. The driver twisted his wheel and worked some levers, and the rhythmical chunking of the engine gradually ceased. Gliding at a speed that was still high, the train curved to the left, and swung down a sharp incline, to move with an imperial dignity through the railway yard at Rugby. 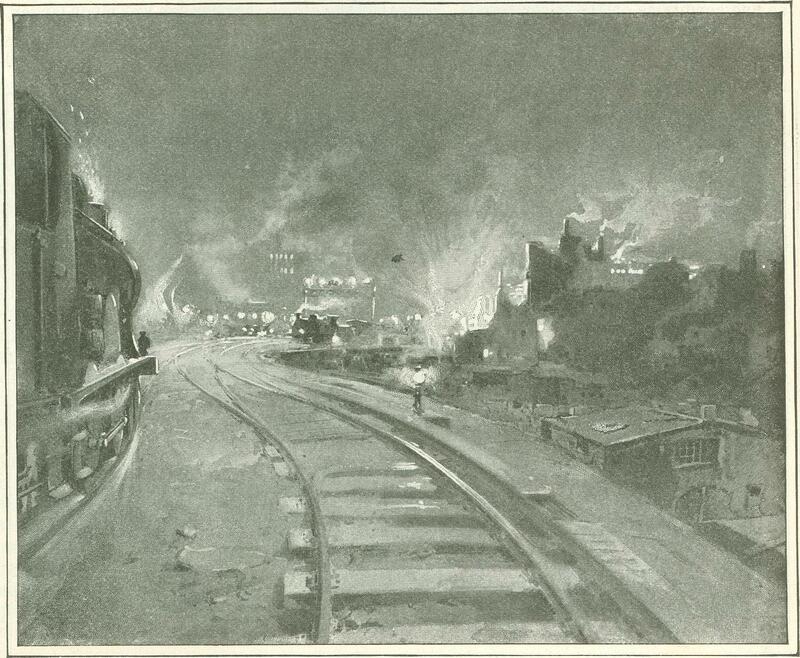 There was a maze of switches, innumerable engines noisily pushing cars here and there, crowds of work­men who turned to look, a sinuous curve around the long train-shed, whose high wall resounded with the rumble of the passing express; and then, almost immediately, it seemed, came the open country again. Rug­by had been a dream which one could prop­erly doubt. They were waited upon by a young man of London, who was supported by a lad who resembled an American bell-boy. The rather elaborate menu and service of the Pullman dining-car is not known in England or on the Continent. Warmed roast beef is the exact symbol of a European dinner, when one is traveling on a railway. 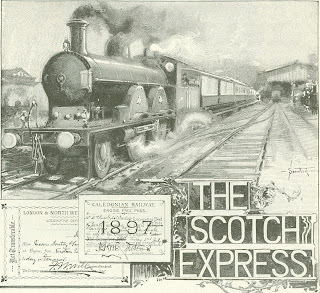 This express is named, both by the public yet appeared to separate these two meanings. 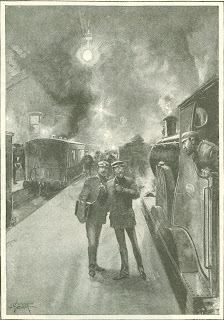 and the company, the " Corridor Train," Each bell rings an alarm and a bid for tea or because a coach with a corridor is an unusual thing in England, and so the title has a distinctive meaning. Of course, in America, where there is no car which has not what we call an aisle, it would define nothing. The corridors are all at one side of the car. Doors open from thence to little compart­ments made to seat four, or perhaps six, per­sons. The first-class carriages are very com­fortable indeed, being heavily upholstered in dark, hard-wearing stuffs, with a bulging rest for the head. The third-class accom­modations on this train are almost as com­fortable as the first-class, and attract a kind of people that are not usually seen traveling third-class in Europe. Many people sacrifice their habit, in the matter of this train, to the fine conditions of the lower fare. At last the relaxed engine, with the same majesty of ease, swung into the high-roofed station at Crewe, and stopped on a platform lined with porters and citizens. There was instant bustle, and in the interest of the mo­ment no one seemed particularly to notice the tired vermilion engine being led away. There is a five-minute stop at Crewe. A tandem of engines slid up, and buckled fast to the train for the journey to Carlisle. In the meantime, all the regulation items of peace and comfort had happened on the train itself. The dining-car was in the cen­ter of the train. It was divided into two parts, the one being a dining-room for first-class passengers, and the other a dining-room for the third-class passengers. They were separated by the kitchens and the larder. The engine, with all its rioting and roaring, had dragged to Crewe a car in which num­bers of passengers were lunching in a tran­quility that was almost domestic, on an aver­age menu of a chop and potatoes, a salad, cheese, and a bottle of beer. Betimes they watched through the windows the great chimney-marked towns of northern England. they hang them to the rail, and thus are still enabled to see through the round windows without dislocating their necks. All the human parts of the cab were covered with oilcloth. The wind that swirled from the dim twilight horizon made the warm glow from the fur­nace to be a grateful thing. As the train shot out of Car­lisle, a glance backward could learn of the faint yellow blocks of light from the car­riages marked on the dimmed ground. The signals were now lamps, and shone palely against the sky. The express was entering night as if night were Scotland. There was a long toil to the summit of the hills, and then began the boom­ing ride down the slope. There were many curves. Some­times could be seen two or three signal lights.at one time, twisting off in some new direction. Minus the lights and some yards of glistening rails, Scotland was only a blend of black and weird-shapes. Forests which one could hardly imagine as weltering in the dewy placidity of evening sank to the rear as if the gods had bade them. The dark loom of a house quickly dissolved before the eyes. A station with its lamps became a broad yel­low band that, to a deficient sense, was only a few yards in length. Below, in a deep Talley, a silver glare on the waters of a river made equal time with the train. Signals ap­peared, grew, and vanished. In the wind and the mystery of the night, it was like sailing in an enchanted gloom. The vague profiles of hills ran like snakes across the somber sky. A strange shape boldly and formidably confronted the train, and then melted to a long dash of track as clean as sword-blades. The vicinity of Glasgow is unmistakable. The flames of pauseless industries are here and there marked on the distance. Vast factories stand close to the track, and reach­ing chimneys emit roseate flames. At last one may see up­on a wall the strong reflection from furnaces and against it the impish and inky figures of workingmen. A long, prison-like row of tene­ments, not at all resembling London, but in one way resem­bling New York, appeared to the left, and then sank out of sight like a phantom. At last the driver stopped the brave effort of his engine. The 400 miles were come to the edge. 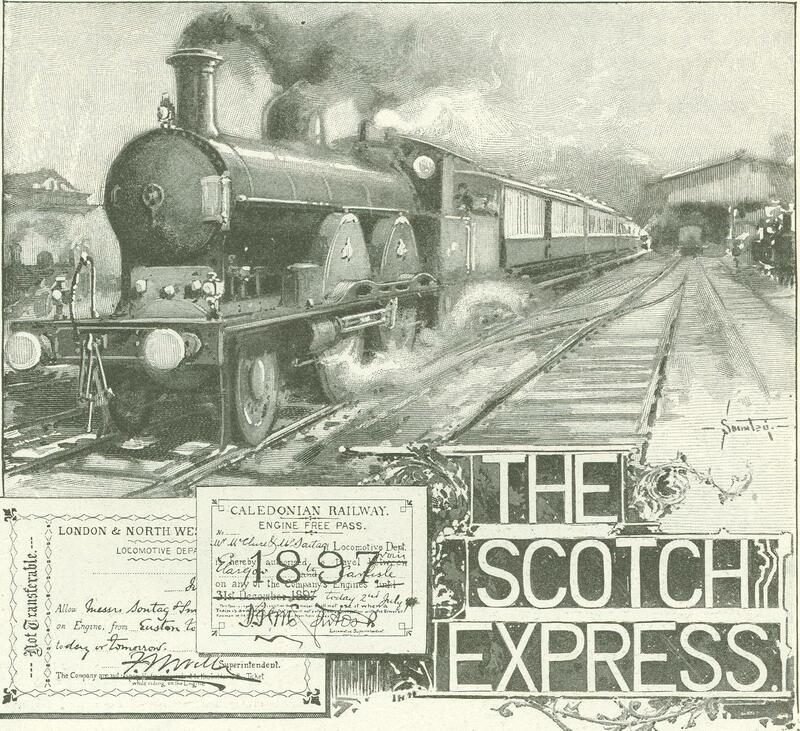 The average speed of forty-nine and one-third miles each hour had been made, and it remained only to glide with the hauteur of a great express through the yard and into the station at Glasgow. A wide and splendid collection of signal-lamps flowed toward the engine. 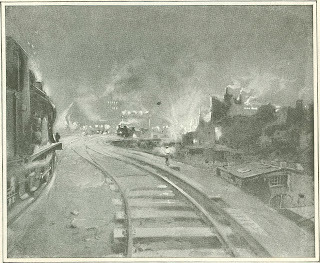 With deli­cacy and care the train clanked over some switches, passed the signals, and then there shone a great blaze of arc-lamps, defining the wide sweep of the station roof. Smooth­ly, proudly, with all that vast dignity which had surrounded its exit from London, the ex­press moved along its platform. It was the entrance into a gorgeous drawing-room of a man that was sure of everything. The porters and the people crowded for­ward. In their minds there may have floated dim images of the traditional music-halls, the bobbies, the 'buses, the 'Arrys and 'Ar­riets, the swells of London.